We discuss how the workplace environment influences our productivity in this episode of The Engineering Commons. Jeff is currently sharing an office, so although he doesn’t have much extra space, he does have a door he can close when necessary. Brian uses his office as a storage locker, collecting old printed circuit boards and spare parts. Robert Propst, the inventor of the office cubicle, came to hate his creation. A 2013 article in Forbes, “New Research: Workers Hate Their Cubicles,” argued that claims of open-plan offices leading to greater collaboration are not backed by scientific evidence. 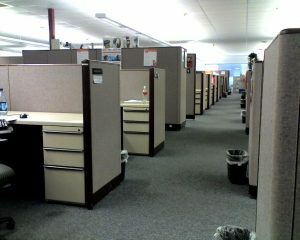 According to a 2014 article in the Washington Post, changes to the IRS tax code during the 1960s caused the office cubicle to become popular with employers. Similar changes to the tax code, in 1943 and 1954, led to the United States’ system of employer-provided medical insurance, according to a 2009 NPR report. Carmen recreates a scene from the television show “Seinfeld” in which Kramer and Jerry discuss write-offs. Listeners wanting to know more about the modern office can check out the book, Cubed: A Secret History of the Workplace. We reference a few chapters from Peopleware: Productive Projects and Teams, by Tom DeMarco and Tim Lister, in our discussion of the workplace and productivity. From Table 8-1 of the Peopleware book, we learn that only 38% of those ranked in the top performance quartile felt they were needlessly interrupted by others, while 76% of those in the bottom quartile felt they were frequently interrupted without cause. Phillip Crosby’s 1979 book, Quality is Free, is frequently misinterpreted by managers, according to the authors of Peopleware. Jeff cites Parkinson’s Law, which states that work expands to fill the available time. Thanks to Tim Patterson for use of the photo titled “I Love Cubicles…” Opening music by John Trimble, and concluding theme by Paul Stevenson.